The Concert for New York City was a benefit concert, featuring many famous musicians, that took place on October 20, 2001 at Madison Square Garden in New York City in response to the September 11, 2001 attacks. Aside from performing for charity, the concert was an attempt to honor the first responders from the New York Fire Department and New York Police Department, their families, and those lost in the attacks and those who had worked in the ongoing rescue and recovery efforts in the weeks since that time. The concert was organized by Paul McCartney and included many of his legendary British contemporaries, including The Who, Rolling Stones bandmates Mick Jagger and Keith Richards, David Bowie, Elton John, and Eric Clapton. 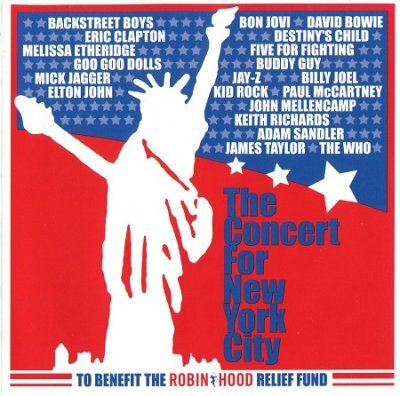 American artists included Bon Jovi, Jay-Z, Destiny’s Child, the Backstreet Boys, James Taylor, Billy Joel, Melissa Etheridge, Five for Fighting, Goo Goo Dolls, John Mellencamp with Kid Rock, and a humorous performance by Adam Sandler as “Operaman,” singing a medley covering the events of 9/11, the greatness of New York City, and about Osama Bin Laden being a coward. Paul Shaffer acted as Musical Director for the show and various celebrities and political figures including Howard Stern and Rudy Giuliani appeared between the acts. Personal Note: The All Music reviewer didn’t care for it. (My guess is that he’s a major U2 groupie.) But I must agree with him that Paul McCartney is positively awful here. There’s a pretty good reason for it though — he had to follow The Who. Now it’s no secret on this blog that I’m a big Who fan. And they certainly do not disappoint here — they give an absolutely blistering performance, warts and all. They really get the NYC crowd going. Don’t believe me? Check out “Won’t Get Fooled Again” for yourself — from about the 7:50 point onwards when Roger lets loose with his primal scream (both on this audio and on the video). I’ve have never been more proud to be a Who fan than right here. Pete and Roger are in top form. This is also John Entwistle’s final USA performance — even though he had been coasting in his live performances of late, he definitely rises to the occasion here. BTW, Zak Starkey also manages to channel Keith Moon in a big way. And oh yeah, there happen to be other performers here too…some of whom I haven’t seen on SACD anywhere else (and IMO with a few of them this is NOT necessarily a bad thing). NYC native Billy Joel is also well received by the crowd and gives a fine performance too.